OSC in now available on all versions of the TMC-1 software. 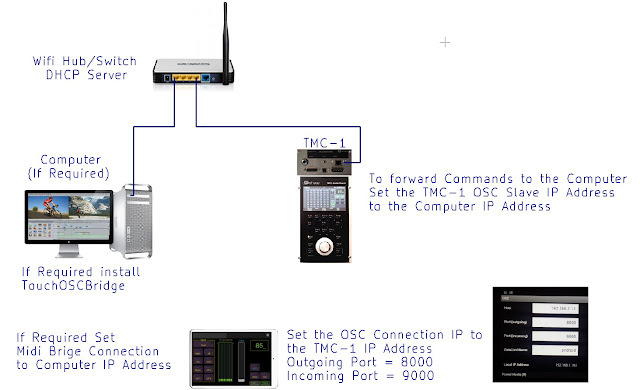 Several people have asked how to connect OSC to the TMC-1, below is the diagram from TMC-1 Reference showing how to make the connections. The only requirement is a Ethernet Server - WiFi or Wired depending on your connection to the tablet. The Computer connection is only required if you wish to control your DAW (Protools, Logic, Nuendo...) from the same OSC App on the Tablet. The TMC-1 will forward any commands that it does not recognize to the Computer, TouchOSC Keyboard and Midi commands will be routed directly to TouchOSCBridge on the Computer. If further routing is required you can install Osculator on the computer. 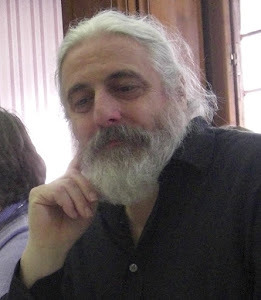 Please check the web first when you need information, I try to keep the web copy of TMC-1 Reference.pdf up to date and add extra information regularly. TouchOSC for you phone or tablet is available from the Apple App Store for IOS or Google Play Store for Android.